Significance : Biggest rose garden in Asia. Zakir Hussain Rose Garden, is a botanical garden located in Chandigarh. 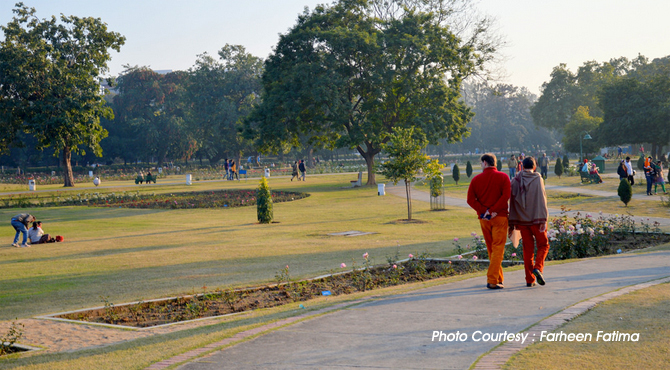 Named after the 3rd President of India, Dr. Zakir Hussain, this beautiful garden was set up in 1967. Created under the expert guidance of Dr M.S. Randhawa, Chandigarh's first Chief Commissioner, it is claimed to be Asia's largest Rose garden. Spread over an area of 46 acres and divided into 10 different sections. The garden has over 20,000 plants of 1,600 varieties. The best time to visit in month of Febrauary - March when all plants are in full bloom with flowers and busily buzzing bees and birds. The rose plants have been planted in carved-out lawns and flower beds. The rose collection has 50,000 rose-bushes of 1600 different species which include natural as well as hybrid varieties developed through tissue culture. Along with the roses, medicinal trees like bel, bahera, camphor, yellow gulmohar, harar etc and unique specimen trees, shrubs and climbers are also seen here which enhance the beauty of the garden. Every year a 'Rose Festival' is celebrated at the rose garden, either at the end of February or the beginning of March. It is one of the main cultural events of the city which draws thousands of visitors. There are lots of competitions, cultural celebrations and many other events. Fountains and bright lights enhance its beauty at night. Apart from serving as a host of other events, the Zakir Rose Garden serves as the venue for hosting the annual Festival of Gardens, a major cultural event of the city. Rose Festival', also known as the 'Festival of gardens' is the biggest Rose Show in the country where magnificent varieties of roses are on display. The festival organised by the Tourism Department of Chandigarh Administration is usually held in the last week of February-March. Over 20,000 people visit this festival. Over 500 exotic varieties of roses are displayed in the three day long celebrations. This festival is aimed at promoting people to stroll through the Rose Garden and enjoy the sight of the blooms. Companies put stalls to exhibit their products during the festival. Several competitions for various rose categories, 'rose prince' and 'princess' competition, brass and pipe band contest, on the spot painting, rose quiz, folk dances, photography competition, antakshri and kite flying are held in connection with the festival. The contests are open to the residents or institutions from nearby places. Alongside the flower show, cultural performances of music and dance; both classical and folk, events for children, exhibitions by local artists; photographers and craftsman, Bollywood Musical shows etc are organized with in these 3 days.